True style never compromises. With the InClock Watch, classic Swiss design meets smart technology to create an enduring timepiece. The InClock Watch makes keeping active and reaching your goals effortless. It goes wherever you go, offering a smart perspective on your fitness. A high-accuracy motion sensor keeps track of your activity. 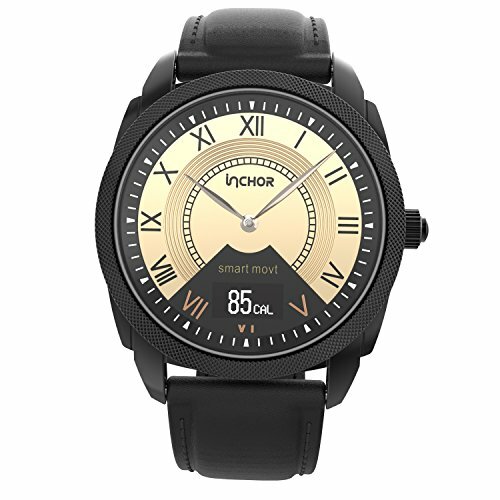 Created using sophisticated materials like a scratch-resistant sapphire crystal, cold-forged stainless steel cases, and fine leather band, the InClock Watch's style is just as advanced as its functional features. Compatability: Android 4.3 / iOS 8.0 and above system . Package Contents: 1 x Smart Watch, 1 x Multiple Language User Manual, 1 x Charging Base, 1 x USB Cable. ★Hybrid Smartwatch Get Notifications for incoming calls, text messages, Emails, Social Messages and calendar. In addition, it can be set 6 kinds of daily reminder. ★【One-Year Warranty】:We warrant this device 12 MONTHS from date of the original purchase for manufacturer defects. If the device fails due to a manufacturing defect, please contact seller directly to initiate return and warranty process. If you have any questions about this product by INCHOR, contact us by completing and submitting the form below. If you are looking for a specif part number, please include it with your message.